Instantly download 3 review request email templates you can use to get more reviews for your business online. Online reviews are the cornerstone for improving your businesses rank in business directory websites. Yelp and Google My Business rely on the quantity and quality of your reviews to decide if they're going to show your business at the top of search results. Without positive reviews (and a several of them), you're doomed to fall to the bottom of search and never be found by customers. Contacting previous customers is necessary to get reviews. 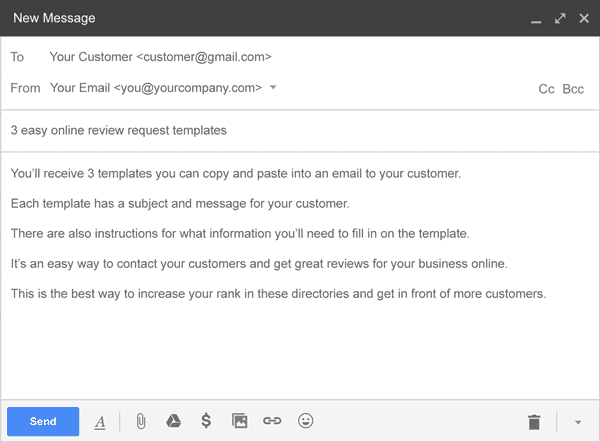 Get these 3 online review request email templates to make it easier for you to get reviews. When you fill out the form for your templates you'll also subscribe to The Online Presence Newsletter. You'll receive helpful emails every other week to grow your business online. You'll never get spam and your email address will remain secure. You can also unsubscribe at any time at the bottom of any email you receive.